We know in competitive exams like CAT, SSC and Bank Basic Math up to class 10th plays an important role. So today we are providing you short tricks for class 10 which will help you in your upcoming exam. These notes are hand written and prepared by Shri Ram Coaching Institue, Sikar (Raj). These notes are divided into 7 parts. 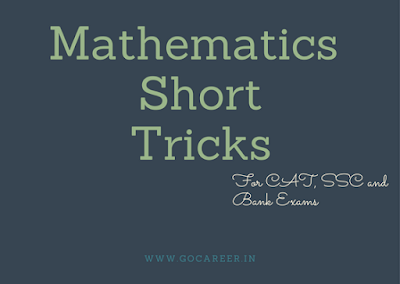 (1) Math Short Tricks Part- 1st: In this part, you will get short tricks for Square and Root, and Multiplication. (2) Math Short Tricks Part- 2nd: Topics Covered, Rule of Division, BODMAS rule, Percentage chapter and Simple Interest. (3) Math Short Tricks Part- 3rd: Compound interest, Partnership, Rectangle, Square, and Circle. (4) Math Short Tricks Part- 4th: Triangle and, Train and speed. (5) Math Short Tricks Part- 5th: Profit and Loss, Average, and Percentage. (6) Math Short Tricks Part- 6th: Time- Work, and Mixture. (7) Math Short Tricks Part- 7th: Compound Interest for 3 years, and Boat- stream.